Tauranga lures tourists in with the magnificent beaches; Rotorua boasts extraordinary mud pools, geysers and colourful steamy lakes; Taupo relies on its giant lake as a great source of activities for tourists all year round… It might seem that despite being New Zealand’s fourth largest city, landlocked Hamilton will never be that attractive to visitors as its glamorous neighbours. But don’t be fooled by the first impression! It’s proximity to Hobbiton is definitely not the only reason to visit Hamilton. But what is Hamilton after all? 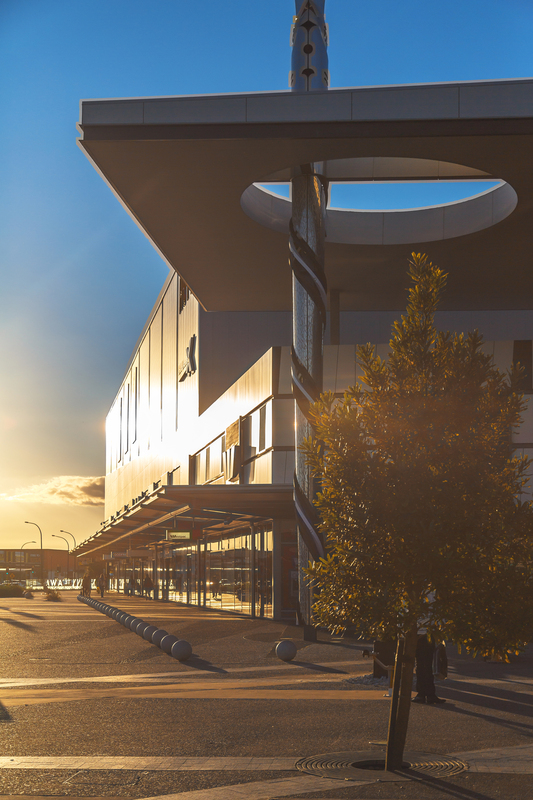 Hamilton is the largest city in Waikato region and with just over 165,000 citizens is also the fourth most-populous city in New Zealand. It’s located on the banks of Waikato river, country’s longest river, that rises at Mount Ruapehu, forms the world-famous Huka Falls in Taupo and crosses the North Island all the way to Tasman Sea next to Auckland (425 kilometres, in case you were wondering). Personally I have always associated Hamilton with students, education and science. And actually, it’s really so! Can you imagine that around 40,000 locals are actually students and yet another 1,000 are scientists? All thanks to Hamilton’s three Institutes: the University of Waikato, Waikato Institute of Technology and Te Wananga o Aotearoa. When to come to Hamilton? 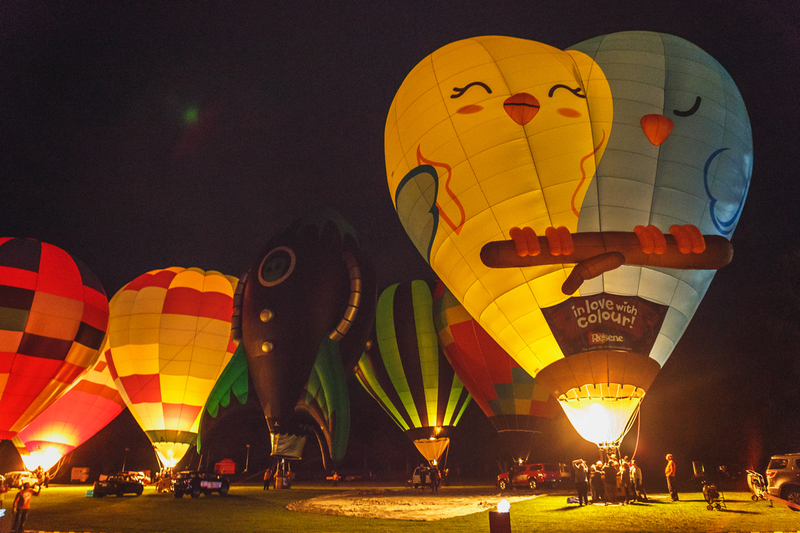 If you’re planning a trip to Hamilton, make sure to do that in March, when the annual Balloons Over Waikato takes place. It’s an iconic festival, that runs for five days in a row and was voted ‘Best Waikato Event’ for six times! 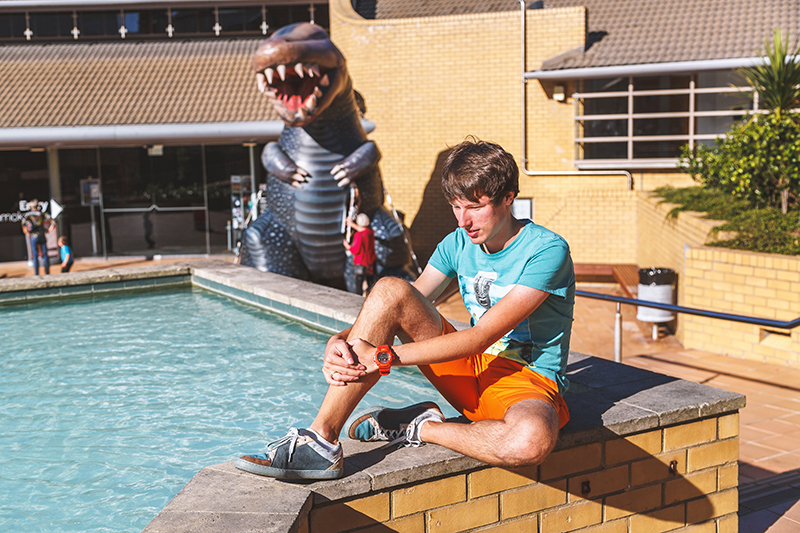 Every year it attracts over 130,000 spectators to Innes Common, Hamilton Lake and The University of Waikato grounds. If you’re not a huge fan of hot air balloons and don’t want to dedicate an entire week to this event, you’d better visit Zuru Night Glow at least. 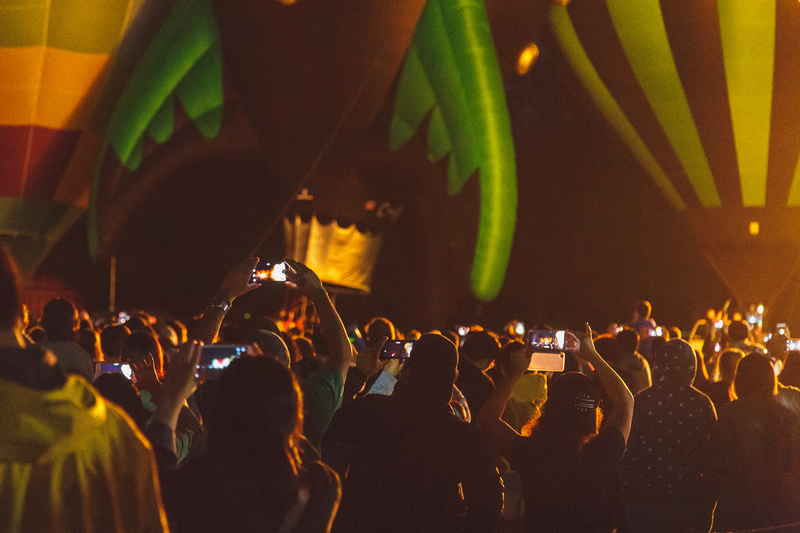 The biggest night out in Hamilton with music, dancers, lots of street food, epic balloons glowing to orchestrated music and, of course, epic fireworks to end up the night. To enjoy the event at its fullest, come in advance, bring a picnic blanket and some board games – the show won’t start before it gets dark, but there is nothing like soaking in the atmosphere of a kind, friendly festival and people enjoying themselves and a sunny warm weekend. And what to do in Hamilton? 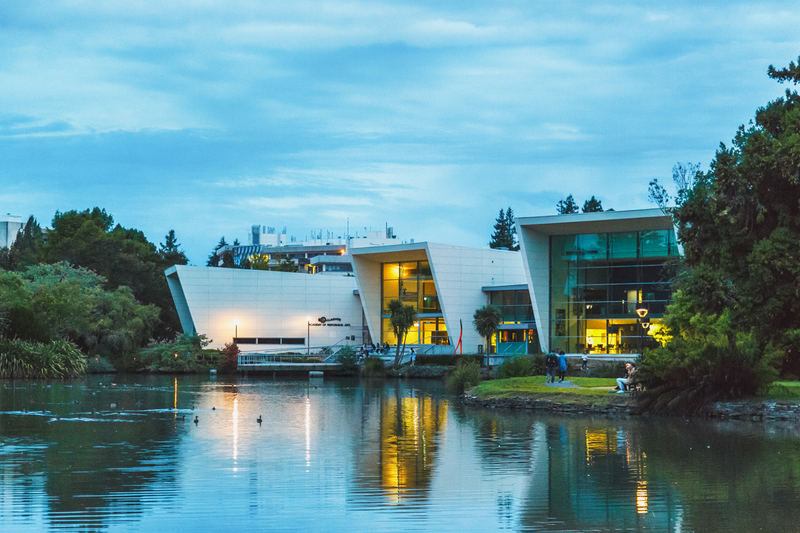 Waikato’s capital has a lot to offer its tourists. And the nicest thing? Many attractions are free of charge! The first must-do of the region is Hamilton Gardens. That is not a traditional botanical garden, rather… a garden open-air museum, that shares the history of gardening and plants from all over the world and throughout the different centuries. 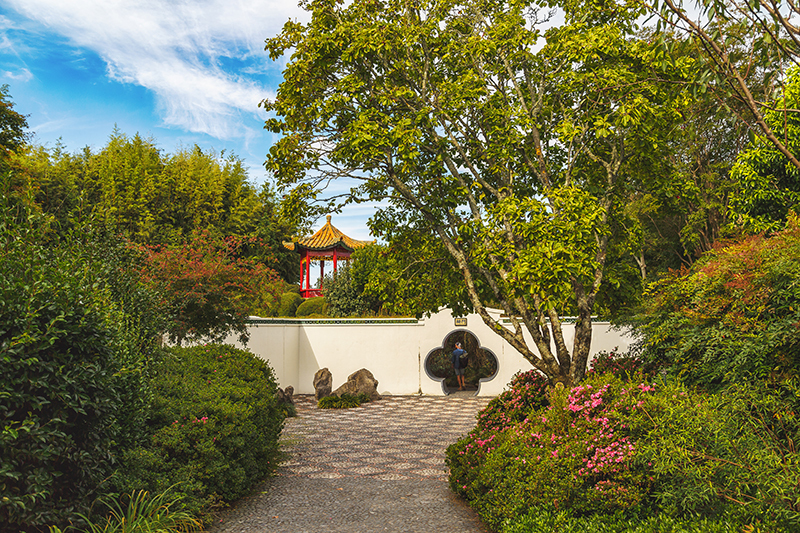 Enchanting labyrinth takes you from the colourful Indian Garden to the tranquil Japanese garden to the ultra-modern and posh American garden and, of course, authentic Tudor one. 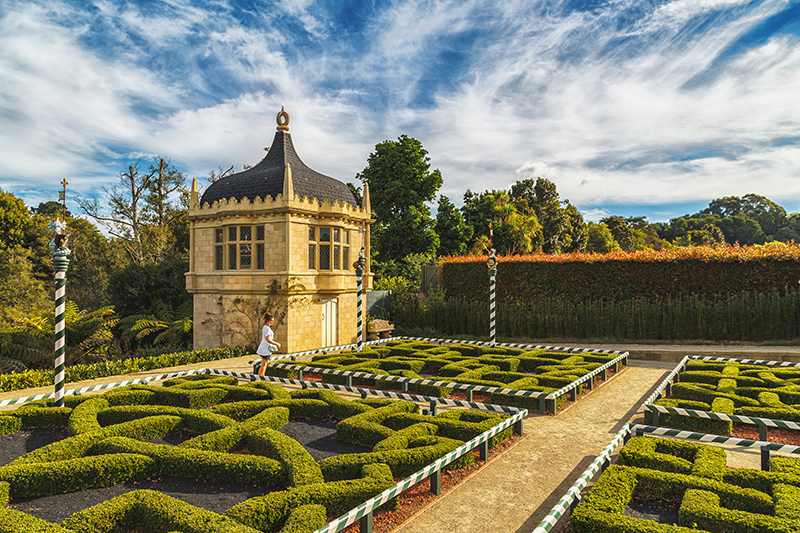 It is very easy to find this tourist’s attraction – Hamilton Gardens are located 5 min away from CBD, right on SH 1. Feel free to pop by at any day of the week during the daylight hours. The place that was always my #1 among things to do in Hamilton is Zealong Tea Estate. 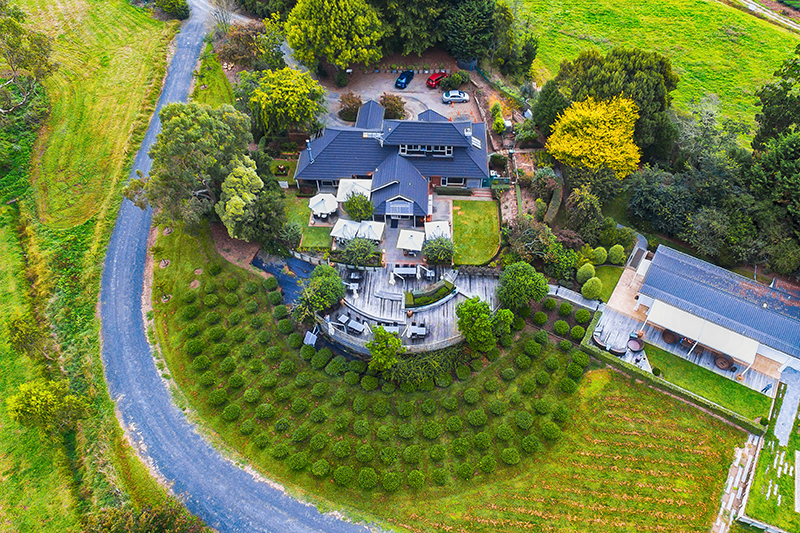 New Zealand’s only commercial tea estate is a magical place to be. You can stroll through the endless tea plantations, enjoy your cuppa at the cosy library or shop in a spacious stylish tea store. But the greatest joy is certainly having a high tea at the local restaurant, overviewing the plantation. What a bliss! Feeling like something cultural and historical? Visit Waikato museum. This place has over 25 new exhibitions every year. Dinosaurs, the Waikato WWI history, fun science for kids and Maori art to name just a few. Except for some exhibitions, the entry to the museum is free. Operating hours: 10 am – 5 pm. Another Hamilton museum you simply can’t skip is Classic Car Museum. Not only do they have over 100 retro cars on display, but they also offer a very authentic dining experience in their Jukebox Diner, where staff is dressed in 50s style dresses and aprons. How cool is that? Surprisingly, Hamilton is also a great destination for some shopping! With Te Awa indoor shopping mall and an outlet next to it, The Base Shopping Centre has pretty much everything you need. I love stocking up on Lush and The Body Shop there. Where to eat in Hamilton? Hamilton might not be the main touristic destination in New Zealand, but it surely made it’s way to every foodie’s travel map. Who doesn’t know the famous Mama’s Donuts (thank God we now have them in Tauranga as well! ), for example. Or an elegant Chim Choo Ree, residing in a giant The Brewery Building, with the menu so fab it makes you wanna snap every single dish. Seriously, who can resist smoked potato ravioli wit Jerusalem artichokes, dates and almonds? 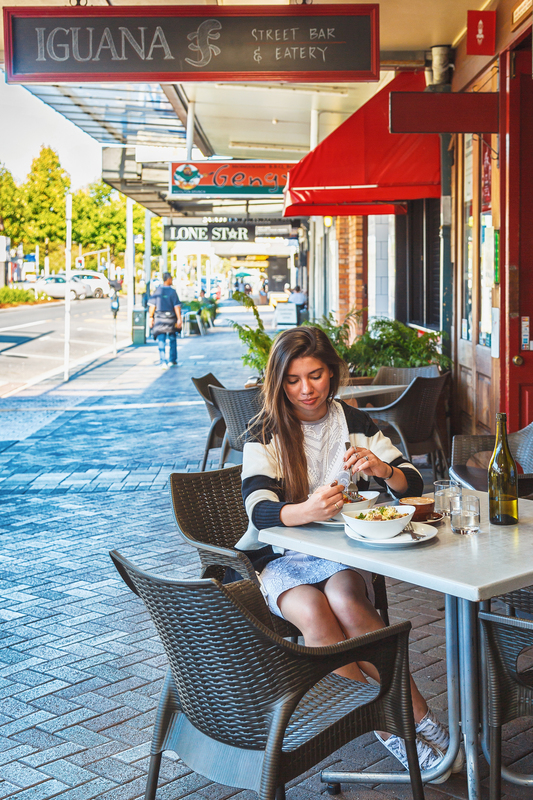 To check out other really yummy local places, head to Victoria Street. Two of our favs are located here – Mexico and Iguana. We’ve always had a soft spot for Mexican food and Hamilton’s restaurant certainly didn’t disappoint. Eclectic, vibrant, spicy and fresh both in food and interior, it’s the perfect place to have lunch or hang out with friends. On our first visit to Hamilton, it was heavily raining outside so we stuck at Mexico for a good three hours with a local friend and oh, what a wonderful and tasty those three hours were! On the opposite side of the road, Iguana beckons with sage, pumpkin and feta calzone… Overall, Iguana offers more traditional European cuisine, so if experimenting with flavours is not what you’re after today, it should definitely be your choice! A little aside from the central part of the noisy Victoria Street, on Graham Street is the fancy Gothenburg. I was dying to check it out since our first visit, because Gothenburg in Sweden is one of my fav cities! But unfortunately, it was closed for a private function.. Though we were more lucky next time and I just couldn’t have enough of my beetroot and potato gnocchi with seasonal greens sauteed in garlic butter, beetroot puree and dukkha. To die for! But the main gem of this place is, of course, it’s view over the mighty Waikato River. No matter if you sit outside, or would prefer the cosiness of the spacious and bright room, you’ll have a great opportunity to enjoy it, as they’ve replaced the walls by the giant panoramic windows here. Great choice for a slow dinner or a romantic evening. But to be honest, the first place I rush to every time we arrive in Hamilton is… Duck Island ice cream! 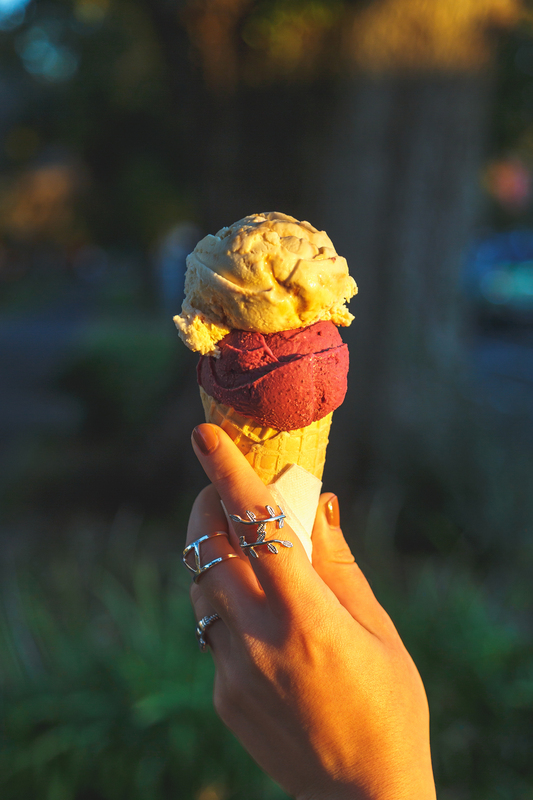 Seriously, I’m obsessed with this ice-cream and have even included it to our list of the fav New Zealand food brands (that grew so much longer since being published, of course)! Cute lil’ cafe, all in bright pink, with lots of smiles and the most friendly and patient staff (happily smiling to visitors who can’t make a choice for half an hour requires lots of patience, trust me). Hope this detailed Hamilton travel guide will inspire you to explore this city asap!